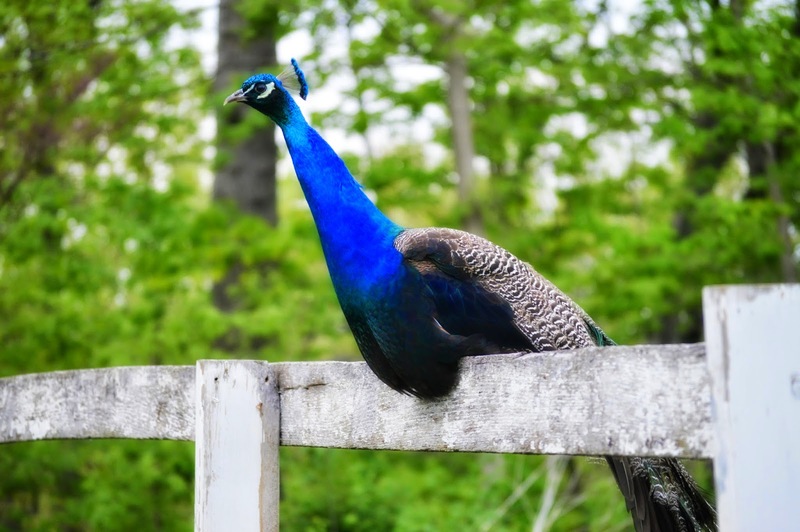 Last week, for Wordless Wednesday, I posted a photo of a peacock. This beautiful bird showed up at my house Tuesday evening, and hung around until Friday evening. I don't know where he came from, or where he went, but I enjoyed my time with him. He was incredibly fascinated with the chickens and guinea fowl. He seemed to have a crush on one particular guinea. He did not demonstrate any sort of aggression towards my poultry. Just curiosity. He was fairly skittish of me, and definitely fearful of the dogs. He enjoyed eating the blueberries, raisins, peanuts and sunflower seeds I offered him. He was quite a bit larger than any of my birds, and oh so beautiful. I wish he would have stuck around, but I hope he found his way home. I now kind of want one of my own. He is so cool! It's interesting that he liked your other birds!! I have always just loved peacocks! My neighbors had a bunch of them when I was a kid, as I grew up in the country - tons of cool animals - and they have always fascinated me! he definitely is handsome, just gorgeous. Wonder where he came from? Oh my gosh, that is wicked cool. The only birds we have around here are Blue Jays and crows, nothing as striking as the Peacock. Great photos too, that's so cute he had a crush on one of your guinea fowl! He's beautiful! I had peacocks for a bit year before last. They're not the friendliest!